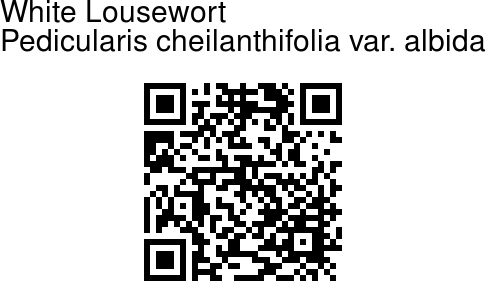 White Lousewort is a perennial herb, 5-30 cm tall, drying slightly black. Roots are fusiform. Stems are single and erect or more than 10, unbranched, with 4 lines of hairs. Basal leaves are carried on 3-4 cm long stalks. Stem leaves occur in whorls of 4, on stalks 0.5-2 cm long. Leaves are linear-lanceshaped, 0.7-4 cm X 2.5-8 mm, pinnately cut into 8-12 pairs of segments, ovate-lanceolate to linear-lanceolate, pinnatifid, double dentate or incised-dentate. Flowers are borne in a head or spike elongated to 10 cm, sometimes interrupted basally. Bracts are leaflike, about as long as flowers basally. Flowers are stalkless. Sepal cup is 8-9 mm, about 1/3 cleft anteriorly, densely pilose along veins. Sepals are 5, unequal, posterior one triangular, entire, lateral lobes larger, serrate. Flowers are white, tube almost erect when young, becoming bent at a right angle basally, up to 1.1-1.4 cm; galea falcate, about 1 cm, tip with a short conical beak or beakless. Lower lip is 8-10 mm X 1-1.2 cm, lobes rounded. 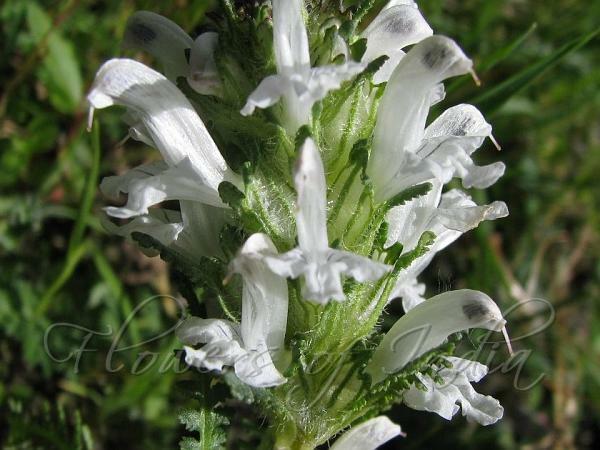 White Lousewort is found in central Asia and parts of the Himalayas, at altitudes of 2100-5200 m. Flowering: June-August.